"Ocean View" Beautifully Restored Coffee Shack! Beautifully restored authentic coffee shack on the scenic corridor of Holualoa! This fabulously restored and redecorated cottage has its own private lanai with full ocean view overlooking Honokahou Harbor and is nested in a small quiet family farm surrounded by bananas and hapuu ferns. The cottage includes a full size private bathroom and a small kitchenette fully stocked with all amenities except the full size stove, but a large propane barbecue with a side burner for pots or skillets will meet all of your cooking needs when combined with the high quality toaster oven and microwave we have in the kitchen. The interior is a very pleasant 400 square feet and is furnished with a brand new COMFORTABLE pillow top mattress to rival the absolute best accommodations on the island. A good night's sleep is SO important when you are on vacation and if you are a seasoned traveler you know those 'other' places can drive you insane with those cheap horrid mattresses that must have been designed by the Marquis de Sade! Our favorite leather couch and chair is there for you to cozy up on in the evenings with your book or to catch the latest Netflix release or watch our full range of Spectrum local and network television if you so desire. A smart little table is nestled between the Ludovia lancifolia palms and the rattan chairs you'll watch the Kona sunsets in while sipping your evening (or morning, or afternoon) mai tais. Tired of your daily grind? Our neighbors a Hula Daddy Coffee can provide you with what could be considered the finest coffee on the planet that you can make whenever you want in the French press or drip coffee maker in the kitchenette. You will also find the blender, and other accessories you won't find elsewhere like a juicer (try it with the starfruit from the Kona Farmers Market), a waffle iron and other must have items. Ask co-owner Daryle for some of his Holualoa sourdough starter found only at Knigge Farms and a waffle recipe! Yum! 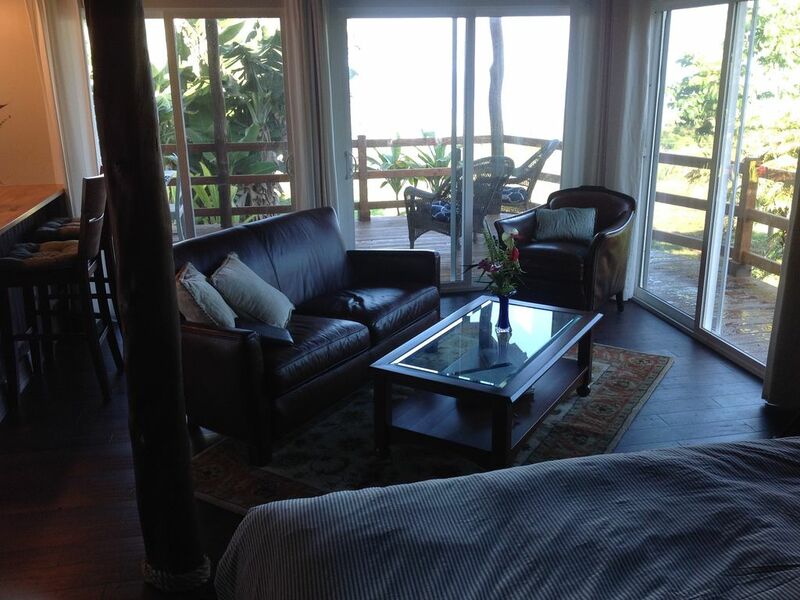 We are just minutes to hiking, the beach, sport fishing. Get up early at least one time to go snorkeling at sunrise at King Kam beach on Alii Drive, one of the many snorkeling spots you will find on this side of the island. My other personal favorites are Kua Bay and the Puuhonua o Honaunau National Historic Park which was once the home of royals, immerses you in Hawaiian culture and "Two Step" beach just outside of the parking lot is just an incredible snorkeling spot! All of these are a must do. Daryle and Shawn relocated from Northern California - both extensive travelers came to the Big Island on vacation and bought a farm on the way to the airport! Shawn worked in the Food Ingredient Industry for 25 years and Daryle, a general contractor built homes in many parts of the world including here on the Big Island and the Island of Kauai. Daryles' attention to detail and artistic talent built his dream vacation bungalow here on the Big Island. We both are avid gardeners and huge foodies! We are extremely excited to share our little Hawaiian farm and our experiences with our visitors and look forward to sharing yours! Why stay in a hot, noisy, nasty condo when you can live like a king in your own cottage? This property was owned by a prominent and well loved Japanese family since 1959 and we were fortunate enough to acquire it when our friend Reba, born and raised on the island and also a well respected local, got wind that it was coming on the market. We were the first and last to view it and the rest is history! The property avoids the "Kona Crawl" in the scorching heat, the bumper to bumper traffic along condominium and resort row down town. It offers private space, pleasant temperatures and a glimpse of old coffee plantation lifestyles and only 5 minutes to town and local beaches! This particular property is rich with citrus, avocado, banana and many trees in addition to a vast crop of birds of paradise and was once an orchid nursery! Kamakahonu Beach, Mahai'ula beach and Pahoehoe Beach Park are all great beaches and close by. Enjoy a view of Honoukai Harbor from the Lani and watch the cruise ships come in over coffee! Lovely generous hosts! Great view, clean and charming abode. We had a wonderful time. We’re spoiled by the hosts and would come again. These folks were SO helpful and friendly. AND--The sunset view from their porch was unbeatable. If you go to the Kona area, you ought to visit with the Knigges. We wanted to stay off the tourist beach condo row and discovered this sweet little renovated coffee shack up in the hills above Kona. Super clean and quaint. Very private..didn’t see the owners once after we met them. Very kind and giving people who are available if you need anything. We were here to visit friends so we really didn’t need anything other than a great place to sleep and wake up to. The property has so many beautiful plants and we felt nestled into paradise. Great deck to meditate and feel the aloha spirit. The bed is super comfortable with fluffy pillows. My only suggestion would be a fan over the bed or one next to the bed..the fan is over the sofa which is lovely but if you sleep hot like I do...another fan would have been perfect. We were here during the volcano so weather was a little unusual but not enough to deter you from visiting. Our stay was amazing and we are so thankful we stumbled upon this property when searching for places to stay. I highly recommend Knigge Farms and would book again in the future. You must try Hula Daddy coffee right around the corner. The best tasting coffee we’ve ever had and the most expensive! We splurged and bought half a pound and enjoyed it on the lanai every morning. Plenty to do in Kona and loved how easy it was to get everywhere from our place. Sorry to leave...never enough time. Thank you Shawn and Daryl for creating a beautiful place for people to enjoy this special island. Aloha! Very comfortable, close to town and the airport. The coffee shack was far from a shack... it was nicely appointed with modern features to make a very comfortable stay. Shawn and Daryle are Great hosts. They were there if you needed anything and gone if you wanted seclusion. My wife and I enjoyed the unit and will be back. Great home base for Big Island exploration. My husband and I spent June1-8 at Knigge Farms restored coffee shack. We were very comfortable and found that it was a perfect location for our island day trips. We were close to services in Kailua-Kona but away from the congestion and traffic of town. The studio had great indoor and outdoor sitting areas, as well as a small kitchen area and gas BBQ for preparing meals. The bed was a queen and very comfy. I was concerned I’d miss our king bed but that was never an issue. Daryle and Shawn were attentive and friendly hosts who were good resources for restaurants, beaches and day trips. We thoroughly enjoyed our stay in the “coffee shack”. We so enjoyed getting to know you guys! Please look us up the next time you visit the Big Island we would love to have you back! Shawn, Daryle, Jackson and Mr. "M"
Here in Kona you will find world class sportfishing, with international billfish competions. Fish for Ahi, Ono and Mahi Mahi. We can connect you with one of the best charters and you CAN keep your fish! Surf and boogie board, or just lounging on the beach for a tan. Hawaii Volcanoes National Park is on the Big Island too. At its heart are the Kīlauea and Mauna Loa active volcanoes. The Crater Rim Drive passes steam vents and the Jaggar Museum, which features volcanology exhibits and a viewpoint overlooking Halema'uma'u Crater. Thick ferns mark the entrance to the Thurston Lava Tube (Nāhuku). The Chain of Craters Road weaves over lava. Trails crisscross the park. Kīlauea Volcano continues to erupt at the summit and at Puʻuʻōʻō vent on the East Rift Zone. The episode 61g lava flow from Puʻuʻōʻō is entering the ocean at Kamokuna. "The Ditch" was hand drilled and blasted over a century ago out of solid rock deep in the canyons of Kohala and 'Flumin’ Kohala' offers you a rare opportunity to explore this remarkable hand-wrought wonder and the pristine Hawaiian landscapes it crosses. Our 5 favorite (+ 8 smaller) waterfalls on the Big Island are easy to visit, large and spectacular. If you are on this side of the Big Island, for example, to see the Hawaii Volcanoes National Park, a bit of planning will make sure that you can see some spectacular waterfalls. Holualoa Village Coffee & Art Stroll at Historic Holualoa Village- Stroll through the art district of quaint Holualoa Village and visit galleries exhibiting an extensive collection of local artists. Over 30 Kona coffee farms join the festivities offering tastings and product for purchase. Check-out Swim with Dolphins and Dolphin Watching adventures in Hawaii! Go to the places dolphins love to play for watching or snorkeling at a distance, or even interact one-on-one with these precious sea mammals for an unforgettable swim with dolphins experience. Watch as they perform dazzling stunts in the wild or in a controlled environment, Big Island offers it all! Kayaks are also a popular water sport on Hawaii Island, especially in Kealakekua Bay. Explore the numerous coves that dot the Kona Coast. Golf has become such an enjoyable part of Hawaii Life on the Big Island that golf balls are even flying on the upper slopes of Mauna Loa (elevation 8,000 feet). As one of a NASA-sponsored group of researchers simulating an extended stay on Mars, PhD student and former college golfer Jocelyn Dunn recently practiced her golf swing on the heights of Mauna Loa on the Big Island of Hawaii in a spacesuit. All along the West Coast of the Big Island, world-class golf courses pepper the exquisite Hawaii landscape. From private golf clubs like Nanea, Hokulia, Kukio, and Hualalai to the fantastic public courses at Waikoloa, Makalei, and Big Island Country Club, the Big Island has proven itself to be a worthy golfing destination. These are just some of the hundreds of things to do here on Big Island! Same day bookings require a 1 hour window after booking confirmation for the owners to make certain that we are providing the best experience we can offer. *Rates are subject to change prior to confirmation.